Основы исследовательской деятельности педагога-музыканта. Учебное пособие. 1-е изд. The textbook presents the analysis of the content, peculiarities and types of the educational research work of a music teacher, theoretical and empirical methods of the musical - pedagogical research, and the technology of the preparation of a graduate qualification work. 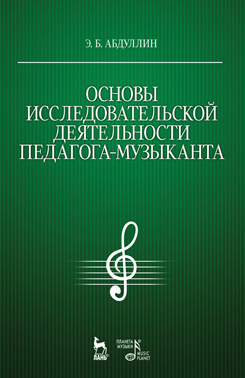 The content of the book includes some extracts from the scientists’ works connected to the problems of musical-pedagogical education. The book also contains the examples of all the types of the research musical - pedagogical works of the students, who are the future Bachelor’s, studying at the department of “Musical education” and “Additional education”. The book is intended for the students of universities. It can be useful for everyone, who is interested in the investigation of the problems of musical education. Л. А. Рапацкая — доктор педагогических наук, кандидат искусствоведения, зав. кафедрой культурологии и методологии музыкального образования Московского государственного гуманитарного университета им. М. А. Шолохова, член Союза композиторов России.